想問一個問題, 如果我想整酥皮底的蛋撻, 可不可以用急凍酥皮做呢, 可以講下大概的做法和要注意的地方嗎? 萬分感激! hi..i am also from brisbane! Just wanna ask u where did u buy those 撻殼? I hv once bought from Coles, but they are all just too soft! Those 撻殼 I used were bought from a shop in HK. Here's their website. Unfortunately, they don't send any products to their customers. You can just place order and have to pick them up in person. Too bad. Hi, I am in Sydney, and I know a few Chinese restaurant supplies shop here sells those 撻殼. The one I've purchased from is in Eastwood called A-1 Restaurant & Club Supplies (http://www.yellowpages.com.au/bi/a-1-restaurant--club-supplies-eastwood-nsw-5609741.html). Hope you can find similar shop in Brisbane la! Thanks for your info. Unfortunately, we don't have any shops selling these 撻殼 as far as I know. Too bad. Thanks for your easy recipes. I tried your eggtarts 食譜. It turns the 撻皮 was a bit chewy. What could go wrong? I thought it might be due to too much butter but my wife think the tart didnt get bake long enough. My kids loves the eggtarts very much. Thanks again. PS: I am a novice cake and this is my 4th times to bake cake-like products. I viewed your pictures on your blog. The edges of your tart shells were quite brown in colour. Were the base of your tarts chewy? If so, the base of tart shells were not cooked through yet. I assume that you've followed though this recipe. So it's possible that the temperature of your oven was a bit higher. Thus, the edges were brown enough before the base got ready. What kind of oven did you use? A conventional one? Every oven has different power and different effects on baking. So we have to try and experiment our own ovens to get most of it. 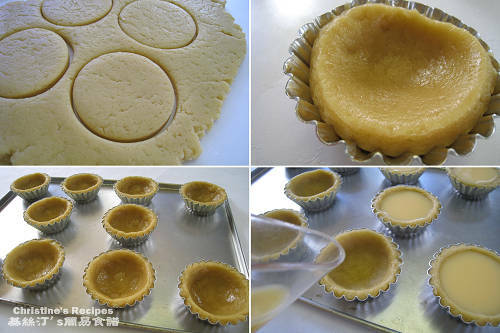 Try to lower the rack when you bake egg tarts again, because the tart shell bases need more temperature and time to cook through. Keep an eye on the edges of shells. Once the edges turn golden, slower the power of your oven. Wish you luck in second try. Happy baking! Thanks for your advices. Will let you know the result on my next try. I have a "Kenmore 6 Slice Convection Toaster Oven" Lowest rack is the only choice for baking. A toaster oven usually produces more direct heat over the foods you bake. You might try to lower the heat as well. I think your toaster oven could do the job anyway. I live in NY, USA. My 2 years old daughter loves eating snacks.. I always tried to made my own snack for her instead of buying it. I love your recipes here, it's great portion, taste great (not too sweet, not too salty). 1 funny thing when i made the tart, i didn't ve 牙簽 in my apartment. Guess what i used??? Aw, you used a 9cm tart mould. What a big egg tart you baked. Congrats on your baking success! Thank you very much for your receipt. I did it on Sunday. It turned out very nice! My husband and kids love it. They ate them all! I reduced both the amount of sugar-it tasted perfect. Thank you again for sharing the receipt. I just made it, so yummy!!! I made a batch tonight and the tarts are so delicious! Thank you for another great recipe. Is it possible to substitute half the butter for olive oil, margarine or shortening to make it a bit healthier? Thanks, Christine. Why not? You can try, but the taste might be a bit different. 今天, 母親節日特意安排整, 結果不成功, 2次整皮都不成功, 不知道問題出了在那裡. Hi, nice to read your blog. I want to ask how you measure the mold (7cm x 3cm)is the upper part of the mold is 7cm and the bottom part is 3cm. I measured the diameter of the top and the base part of the mould. 1. 請問用 coffie milk代替花奶可以嗎 ? 2. What is 全蛋汁液 ? 1. Coffie cream 是否等於花奶 ? 是否與花奶一樣用法? Thank you for your recipes. I've tried a few already, and particularly appreciated the various tips. One question: Can I 'blind bake' the tart pastry first, or perhaps half bake it first? I've read all the comments above and have noticed someone asked the same question, but didn't see an answer. Thanks for leaving message and letting me know you tried some of my recipes. So you might've read that I repeatedly stated that utensils used in every kitchen are very different. 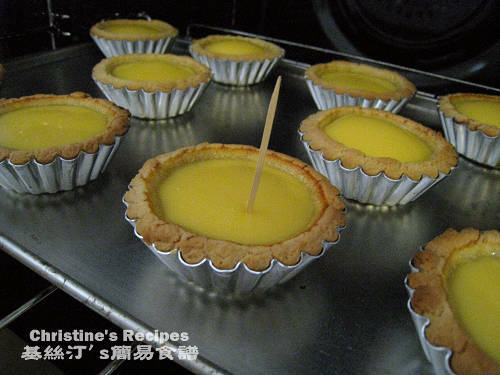 I have used this egg tart recipe for many many times, loosing counts up to now. And it works for me every time. So I don't need to do any blind baking when I make these egg tarts. If you like to try blind baking of the tart pastry first, why not? It might work better for your oven. Just a little note, do bake as shortly as you can while blind baking. The crust might turn too dry. Wish you all the best. Happy baking. ive tried it yesterday and it turned out really good:) thx Christine:) i only made 6 tarts and my brother ate four of them!! but i think the custard is a little bit too sweet, but my brother thought it is prefect:) thx so much for sharing the recipes. wanna ask will i have a way to show you the photo of my egg tarts? Glad that your family loved my egg tarts. I'm thinking to get a toaster over to make this tart, do u think it's alright? This recipe should work for toaster ovens. But I haven't tested how long the egg tarts should be baked in any one of them. I just use mine to reheat my baked tarts. You have to test and work it out yourself. Sorry. Hi Christine, I'm a student studyin in Melbourne. I filter the egg mixture twice and it looks good. however, after i spoon to the mold, the little bubbles return. how can i prevent? I often use my Pyrex measuring cup to pour the egg mixture into the tart shells. It's easier to manage and avoid from generating any bubbles. Or a teapot will work too. I made them tonight and they were so good! I cheated on the crust by using store-bought mini graham cracker pie crust to save time. They were baking while we ate dinner. My 4.5 year old son who loved custard when we visited Taiwan was shouting "hooray" when he tasted my warm custard tart. Thank you so much for your blog. You can. Whatever size of moulds you use will do. Just follow the same steps and adjust the baking time. hihi!!! I want to know if u also have 酥皮底 recipe too!!! cuz im the big fan of 酥皮蛋撻!!! and by the way i really like all your sweet recipe!!! make it so easy to learn!!! hi!! i want to know if u also have the 酥皮蛋撻 recipe too!! cuz im a big fan of 酥皮蛋撻!!! Hi Christine,我的焗爐不能中途打開（因為門一開就會停爐），咁點算呀！仲有，我做左2次，第一次撻底唔熟（好似濕左咁），第二次先焗個撻，情況好左些，但個底都仲有唔熟。同埋焗後個面好似蒸蛋咁，蛋液都好似面過熟，中間唔熟！（我個爐冇上下火之分）pls help and give me some advise ! Thanks! Merry Christmas, Christine! I'm just wondering, do you have a recipe for coconut tart? Many thanks! I had made once long time ago (was failed), but today I made up my mind to make again. I had prepared the ingredients few days ago, so everything was ready and stick to the recipe. And it turned out great, I know only if you do things seriously it could get good result. Thanks for the recipe and I have read all the comments which some of them are quite helpful. Glad that you tried this recipe with success. Sorry, don't have the recipe at the moment. OK！過兩日再試一下。一定要成功。太愛蛋撻啦！Thanks so much Christine!Happy 2012~!! i think u've missed out the icing sugar step on your english copy. thanks for sharing the recipe!! i love it:P! I double-checked my english recipe, yet couldn't find the error you mentioned. I didn't miss the sugar part in the method of making crust, step one. Thank you for the recipe, it was easy and fabulous. Thanks for your recipe! compliments from everyone! Your instructions are simple and clear! Support! I have tried this recipe and it works, very tasty. Everyone loved it and asked for more. Hi Christine, I've tried it and it was awesome. But I have a question. I'm not sure how much is 225g of water. Is it the same as 225ml? Or do I just measure in weight as 225g? Thanks so much. Because the egg mixture seems to be very watery and it took a long time to cook... So I was just thinking if I used too much water. Much appreciated for your recipe! The consistency of the custard is just right if it's cooked through properly. 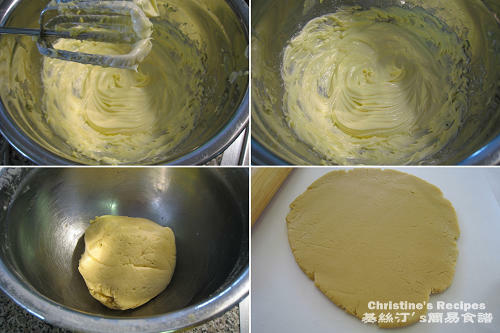 請問 1)plain flour 是cake flour嗎? 是低筋或是那一種? 2) Cookie cutter 是否圖中用以cut 出比撻殼小一點麵團的用具? 請問cookie cutter有大小尺寸嗎? Thank you Christine! Easter holiday 裡嘗試了做旦撻!剛開始做的時候,旦撻皮較厚身,所以焗好之後比較硬. 但後面的嘗試做薄身點, 口感就不同了! 謝謝你的食譜和指導! Hello Christine, I've been following your blog for quite a bit and love it! 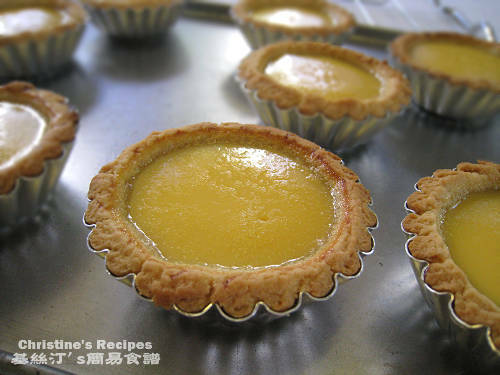 I am trying to get those egg tart tins in the US but don't know what sizes they are. Do you know how big are those tart tins? The size of the tart tins I used is 7cm diameter x 3cm depth, already written in the recipe. If you're living in US, you might like to try Amazon, click here to have a look. 多謝妳分享這食鐠，我家人非常喜歡我的作品，I changed little bit of your recipe to plain flour 200g and milk powder 25g. 我覺得香口D。once again, thank you very much for your sharing. I tried your recipe last weekend and the egg tarts are fabulous. My family love them and my daughter thought they are better than the store-bought ones here in US. Thank you. So glad that you and your daughter loved the egg tarts. Homemade and straight from the oven ones are the best! Have tried the egg tart recipe. It was really good. My husband loves it and my mother-in-law ate two without stopping. My husband's colleague ate it in one mouth and took the left over back home to his kids and wife. I followed exactly what you have mentioned. The only difference is the baking time and temp. I used 200 degree Celsius until I saw the pastry turned a bit brown. Then I turned down the temp to 180 degree Celsius and baked for around 25 mins until the custards turned brown (without opening the oven door). It looks like the Portuguese egg tart's custards and the custards are just right. Not watery nor chewy. The pasty is crispy. Thank you very much Christine. It is my second time using your recipe and every time the food turned out great. I will continue to follow your facebook and recipe website. It is good to taste the real hometown food when you are living abroad. I am currently living in Finland. Aw, wonderful news of trying my egg tart recipe. Yeah, I'm totally with you. How nice when watching your family and friends enjoying what you made and served for them. Honestly speaking, this egg tart is always a big hit in every social gatherings. Every oven performs quite differently. Yours was a clever move. Thanks for sharing. What can I substitue for icing sugar and caster sugar? I can only find granulated sugar in the supermarket. Thanks! Yes, you can use caster sugar instead. Hi Christine! I followed your recipe and it turns out pretty nice! Took a little longer for the crust to cook but it tasted great.